(Nanowerk News) Applications as diverse as oil-well drilling and robot-driven surgery are driving demand for improved micro-electromechanical system (MEMS) pressure sensors. As they are made smaller, however, simultaneously achieving high sensor stability and sensitivity becomes progressively more difficult. 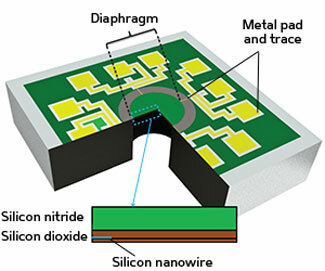 A research team from Singapore and South Korea has now overcome this technical challenge by producing a miniaturized sensor that couples a key component — a stable diaphragm — with sensitive silicon nanowires ("Optimization of NEMS pressure sensors with a multilayered diaphragm using silicon nanowires as piezoresistive sensing elements "). In principle, the design of a miniaturized pressure sensor is straightforward: create a pressure-deformable diaphragm and then embed a piezoresistor made from a material in which pressure causes a change in electrical resistance, such as a silicon nanowire. In practice, however, problems including difficulties with circuit design and fatally fragile components often plague development of a commercially useful sensor. The pressure sensor inset into a metal pad. The circular diaphragm is shown with the silicon nitride layer in green and, in purple, the silicon dioxide double-layer with embedded silicon nanowires. By combining and optimizing three forms of silicon, the research team, which included Liang Lou at the A*STAR Institute of Microelectronics in Singapore, was able to develop an MEMS pressure sensor that is operationally robust, and shows promise for use in robotic surgery. Since the diaphragm must transfer small pressure changes to the piezoresistor while maintaining resistance to deformation and breakage, material selection is crucial. Lou and his co-workers considered using silicon dioxide for its excellent pressure sensitivity. However, this useful property is countered by a strong tendency to buckle and twist even without pressure. Their solution was to use a double layer of silicon dioxide — with piezoresistive silicon nanowires embedded in between — topped by a stabilizing layer of silicon nitride (see image). By etching down the silicon nitride and varying the thickness and treatment of the silicon nanowires, the team found an optimum combination. The final sensor resisted deformation and mechanical breakage while still providing the linear change in electrical output upon pressure that is desired for sensitive medical instrumentation. The team’s main target now is to realize an implantable miniaturized medical device, according to Lou. Despite this goal being reliant on advances in circuitry research and extensive testing prior to use in humans, the sensor not only shows great promise but also points the way to future silicon nanowire-based sensor design.